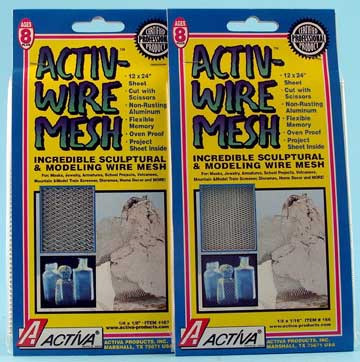 * Activa's Activ-Wire Mesh - the perfect armature or structural support for all of your modeling; a unique material for direct wire sculpture and an amazing general art and craft material. * Made of non-rusting aluminum, Activ-Mesh is easy to cut with household scissors. * It's oven-safe, you can even use it with polymer clays! Available in two mesh sizes for greater versatility. This product is shipped from our warehouse in Marshall, TX, USA.